Hello, all! I hope you're having a great thanksgiving filled with a second (and third) helping of good eats. I'm on the second hand soap I purchased from Bath & Body Works', Crisp Morning Air. I was attracted to the contrast of the label's muted yellow and rusted red leaves print, and the hand soap's blue coloring. 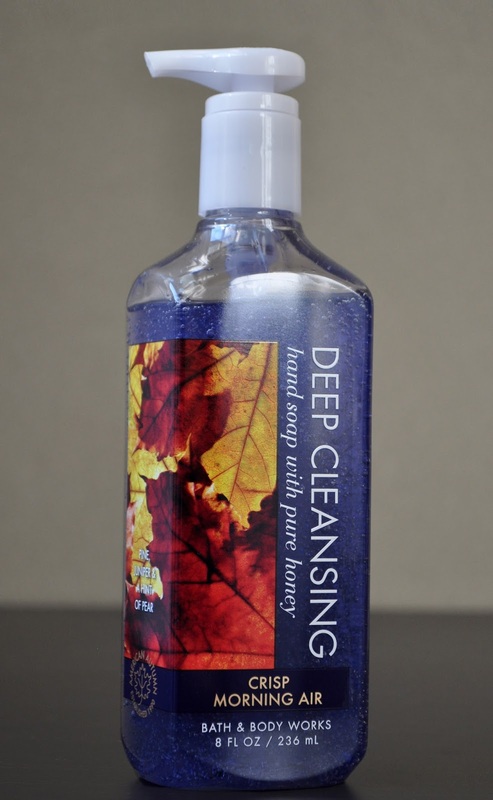 A cool, refreshing, crisp blend of Pine, Juniper & Pear (I also get notes of apple with a hint of evergreen in the scent), Crisp Morning Air Deep Cleansing hand soap captures the brisk, chilly mornings of Autumn. I love the scent, and how well it leaves my hands clean. But, I do find after using it several times throughout the day, my hands feel a little dry by the end of the evening. Nothing a little hand cream can't cure.